DI Ray McBain is a loner with a troubled past, having moved from one institution to another - children’s home to seminary to police force. When an elderly man is found brutally murdered in a Glasgow flat, marked with the wounds of the Stigmata, McBain’s past comes hurtling forward to the present. Heading up the investigation, McBain suppresses information that will get him removed from the case and leans on a young female cop to keep quiet. It’s a move that comes back to haunt him, along with violent nightmares and repressed memories. As he desperately searches for the killer his carefully constructed world starts to unravel, leaving him looking like the prime suspect. 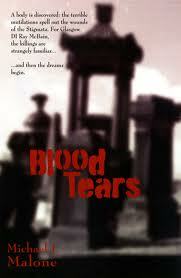 Blood Tears is a remarkably assured debut novel. It manages to be both a detailed character study of a police officer with a dark, troubled history, and a well-plotted, psychological police procedural that maintains an edgy tension from start to end. DI Ray McBain is a complex character, who craves acceptance whilst also being contrary and distant. Malone provides a well-rounded view of his strengthens and foibles, placed in a rich back story, and surrounded by a strong secondary cast. The writing is expressive and taut, and the plot unfolds at a relentless pace, rising to a nice climax. Malone uses misdirection quite effectively, making one wonder where the story is heading and for the most part avoids obvious plot devices. He also avoids explicit violence and gore, except for a couple of places where it is vital to the plot, and does so in a non-gratuitous way. Overall, an entertaining read that marks the start of what promises to be a strong series. Thanks for taking the time to review, Rob. Very much appreciated.